Passive House is today’s most energy efficient building standard. Buildings that meet the Passive House standard use 80% less energy than conventional buildings. A Passive House conserves energy by creating a virtually air-tight, super insulated, compact building envelope that uses the sun and internal gains to achieve space conditioning. A heat recovery ventilator (HRV) is used to condition extract air and provide superior indoor air quality. “Maximize your gains, minimize your losses”. These are the basic tenants of the Passive House approach. A Passive House project maximizes the energy efficiency of the basic building components inherent in all buildings; roof, walls, windows, floors and the utility systems: electrical, plumbing & mechanical. By minimizing a building’s energy losses, the mechanical system is not called to replenish the losses nearly as frequently, saving resources, operational costs and pollution. Unlike any other structures, Passive House buildings maintain occupant comfort for more hours of the year without the need for mechanical temperature conditioning of the indoor air. The opposite has been the norm in this country with a history of inexpensive fuel and construction techniques with little consideration for energy losses through thermal bridging, air-infiltration, let alone being conscious of using some or even any insulation. Passive House design uses detailed, specific annual weather data in modeling a structure’s performance. Orientation of the windows can maximize or minimize solar gain and shading. Passive House theory leans towards minimizing the surface area to interior volume ratio, favoring an efficient shape to minimize energy losses. To keep the heating/cooling in, wall assemblies require greater insulation values to “stop the conditioned air” from leaving. Walls are typically twice as thick as today’s standard construction, for good reason. Wall assemblies are analyzed to allow for proper water and moisture management to make a long lasting and an exceptionally healthy building. Historically these items are the weak link of a building’s envelope and thermal defense system. Passive House places significant emphasis on specifying high performance windows and doors to address this concern. To meet the high performance needs of various climate zones, windows must meet strict performance standards regarding: component insulation, air tightness, installation and solar heat gain values. Anyone who has been in an older drafty home understands how stopping unconditioned air from squeezing to the inside, effects comfort and the efficiency of the mechanical system. Passive House takes great care in designing, constructing and testing the envelope for an industry-leading control of air leakage to the interior. Blower door testing is a mandatory technique in assuring high performance. Walls are designed to be virtually air tight, while allowing water vapors to dry out providing an excellent strategy to maintain a healthy environment. The “lungs” of a Passive House come from a box called a heat (or energy) recovery ventilator (HRV/ERV). It provides a constant supply of tempered, filtered fresh air 24/7 and saves money by recycling the indoor energy that is typically found in exhaust air. The heat from outgoing stale air is transferred to the unconditioned incoming fresh air, while it is being filtered. It provides a huge upgrade in indoor air quality and consistent comfort, especially for people sensitive to material off-gassing, allergies and other air-borne irritants. Using these basic principles, Passive House buildings have been very successful worldwide with somewhere 30,000 and 50,000 buildings built to the Passive House standard in Europe. North America is just catching on with less 300 buildings built to the Passive House standard. Proven sustainability, unmatched comfort, and excellent indoor air quality all with very low energy consumption. 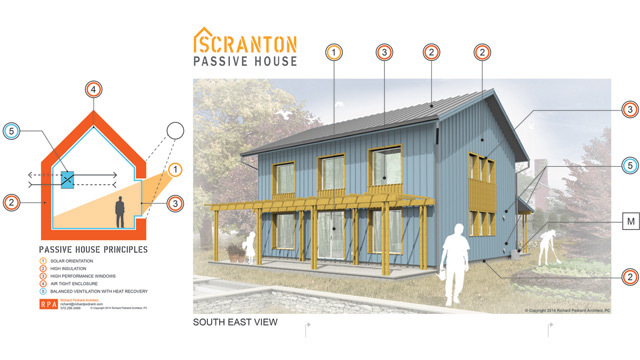 The Passive House approach is the future of the building industry.